Size: Overall 11 1/2" (bowl 2 1/2" wide, 3" long and 1/2" deep) The Cook’s Spoon with holes is a superior spoon designed by and for serious cooks. This large spoon features an extra long handle to allow you to easily reach the bottom of pans and dishes. It has a thumb recess for comfort, with holes in the bowl of the spoon to drain juices and liquids. 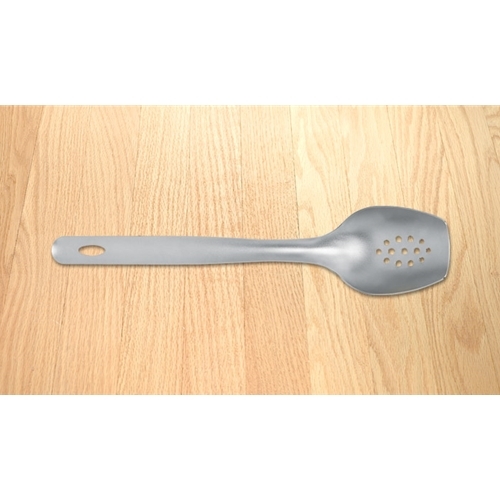 This makes a perfect serving spoon for fruits and cooked vegetables, as well as the ideal utensil for cooking pasta. The stub-nosed cooking spoon design provides for better stirring and scraping of the flat surface of pans. The stainless steel construction ensures a durability that will make it an invaluable implement in your kitchen for years to come.